I have a few rides that I seem to do every year. One of them is the Whites Ferry Loop. 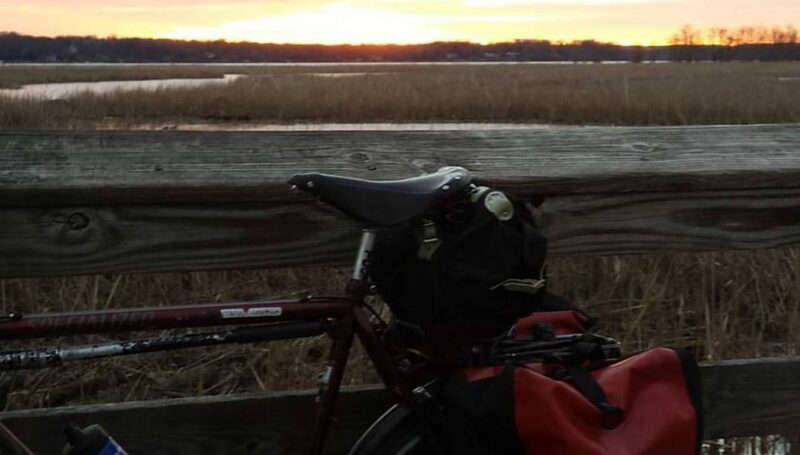 Starting from my home in Mount Vernon Virginia about 6 miles south of Alexandria Virginia, I ride about 10 miles to the start of the Washington and Old Dominion Trail in Shirlington. Next I take the W&OD to Leesburg Virginia, about 35 miles to the west northwest. In Leesburg, north for five miles until I reach the Potomac River at Whites Ferry. Across the river on the ferry, bang a right and I’m cruising back to DC on the unpaved C&O Canal towpath all the way to Georgetown. I ride the last 16 miles home along the river. Todays jaunt began with a hearty, completely inappropriate gut bomb of a breakfast. Grape Nuts with banana and strawberries and milk. And a chocolate chip scone. I waddled out to the bike and headed out. There was not much to report. It was in the 80s with partly cloudy skies. The trail was crowded but I managed to make decent progress. Somewhere west of Vienna, I was passed by Flogini, almost certainly another one of her dopplegangers. It’s impossible to know unless I turn around and give chase so I pedaled on. Off I rode on the trail I had ridden scores of times before. I didn’t stop. I banged a right in Leesburg and played with cars for a few miles. The turn onto Whites Ferry Road was a bit of a relief. Two lanes. Trees and manicured lawns and farms and blues skies and puffy white clouds. It’s a shame the road only lasts a mile or two. 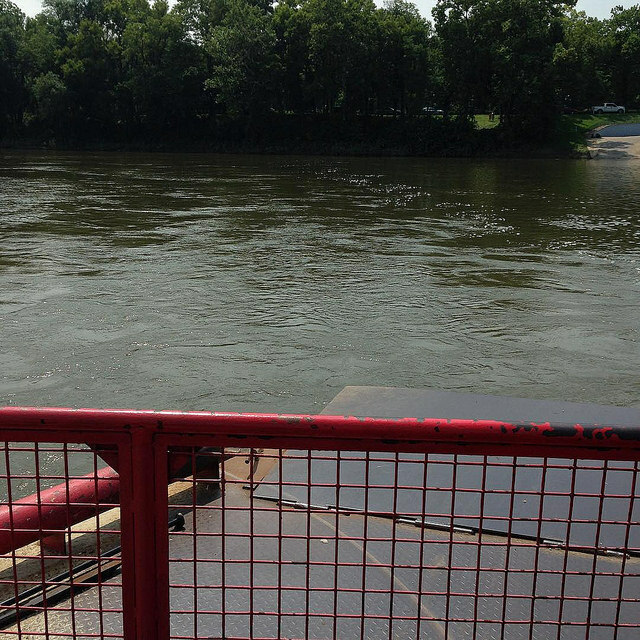 The ferry, called the Jubal Early after the Civil War general, is a kind of goofy operation. It only goes a couple hundred yards, but it’s worth the $2 fare. In the rather pathetic general store, I bought a large bottle of water and an Eskimo Pie. I am a bike nutrition god. Onto the towpath I rode. No pavement and rainy days means mud. With each passing mile the mud got worse. I figured out that the best tactic was to ride straight through puddles. The bottoms of the puddles had a stone surface. No sliding but there was a mess building up on my bike. The last 25 miles were smoother sailing, but bumpier. My triceps were really starting to feel sore. On the plus side, the canal is beautiful. I was waved to a stop by three women who wanted directions to a field of sunflowers. I hadn’t seen any but we got to talking and they had no idea what the C&O National Park was. I explained how there was a plan to use it as a highway until Justice William O. Douglas to a bunch of reporters on a hike. Their stories led to public support for a national park. Lesson finished, I cruised on down to Great Falls where I stopped for water. Into the crowds I rolled. Among the people I likely passed was Kelly, my co-worker who sits right outside my office. Never saw her. My fusiform gyrus made a crackling sound. A mile later I was riding past my favorite section of the canal called Widewater. Here, the canal widens and looks like a pond. Deep blue. Often, but not today, with waterfowl in abundance. What was in abundance was people. All ages. Some kids on wobbly bikes. Hikers. Groups of bros. Families. An emergency cart. Once past the crowds, I fell in behind the cart at a dreary 8 miles per hour. It pulled off at the far end of Widewater where a dozen first responders were standing on the edge of the path. It looked like a drill of some sort. Just 12 miles to Georgetown I passed the Carderock area where I go for my New Years Day hike. Just before riding under the beltway, I saw Lawyer Mike, a Friday Coffee Clubber, pedaling toward me with a purpose. Of course, it could have been yet another misfire of my fusiform gyrus. The bumps were really getting to me. Luckily, the paved Capital Crescent Trail came to my rescue. When I cut over to the CCT, my speed picked up by at least 3 miles per hour. The remaining ride home involved no dopplegangers or co-workers. I had neglected to drink enough water or eat appropriate food and I started riding on fumes through Old Town Alexandria. Thankfully the wind stepped up big time and blew me along. I arrived home with a dirty bike and a sore body. But 101 miles on the odometer. I’ll take it. I made a Flickr album with some pix over here. Post script: It was indeed Lawyer Mike so I am not completely losing it.